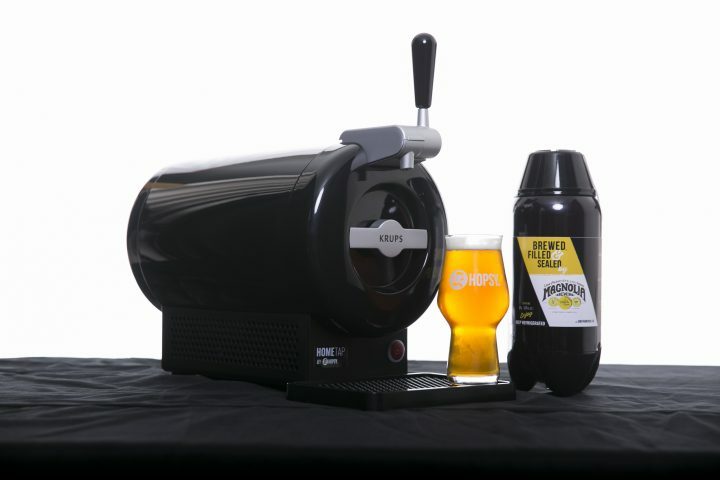 HomeTap is a new countertop beer appliance that makes craft beer accessible on draft at home. Albany, California–based craft beer delivery service Hopsy debuts a new home draft system today. Developed by Krups, the company behind the Nespresso coffee machine, the HomeTap is a countertop draft beer appliance that allows consumers to enjoy fresh, perfectly chilled craft brews on tap in their own home. Customers can order the stand-alone appliance for $149.99; a package containing the HomeTap, two 2-liter bottles of beer, a $50 Hopsy gift card, two tasting glasses, a trucker hat and a T-shirt for $249.99; or a HomeTap Beer Club membership, which includes a HomeTap rental, two 2-liter bottles of beer and a tasting glass for $59.99 a month. Currently only serving the Bay Area and featuring local breweries, Hopsy plans to expand to San Diego by the end of the year and beyond California in 2017. For more information, visit Sf.hopsy.beer.